The politician came up with the idea while checking out one of the country's combine plants. Russian President Vladimir Putin made a joke saying that he could work as a combine operator if he doesn't win the upcoming presidential election. "Just in case, after March 18 I might go to work as a combine operator," the Russian leader said. On Thursday, Putin was inspecting new machinery in the Rostselmash combine plant in Rostov-on-Don. During his visit, he learned how to operate a combine harvester in a training simulator with a computer image of fieldwork displayed on the screen of the windshield. 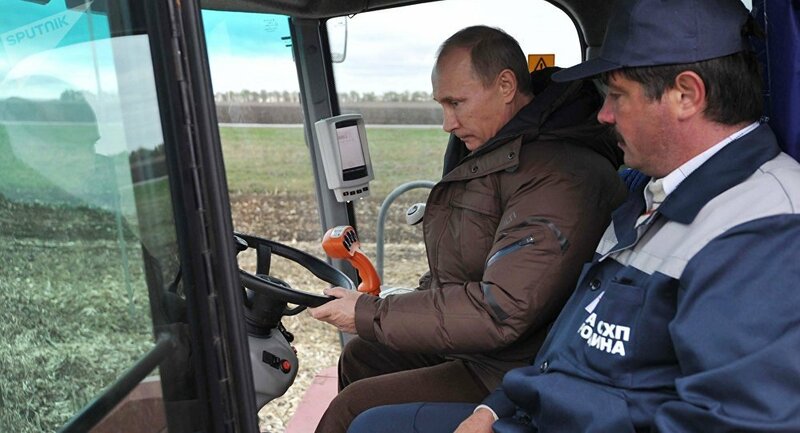 Putin assumed the place of the vehicle's driver and, following the instructions, started to reap the virtual harvest. He made his remark about possibly becoming a combine operator after finishing all the work. Rostselmash is a group of 13 companies that produce equipment under the brands Rostselmash, Versatile, Farm King and Buhler. The corporation manufactures a complete line of machines and equipment for agricultural business at its assembly sites in Russia, the United States and the EU. The presidential election in Russia will be held on March 18, 2018.